That's Right, We're Not from Texas: The Texas Longhorns are Invincible! The Texas Longhorns are Invincible! The Texas Longhorns defeated the mighty Southern California Trojans last night in what was probably one of the best college football games I have ever witnessed. This National Championship Rose Bowl was everything the sportswriters and analysts have been saying it would be for months. The only thing that most of them got wrong was the winner. As most people were ready to crown USC the greatest college football team ever, the Longhorns spoiled the Trojan's run at an unprecedented third straight national championship by beating them 41-38 in their own backyard. 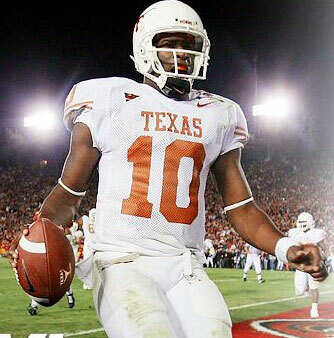 Texas Quarterback Vince Young, the game's MVP, piled up 200 yards rushing to go with 267 yard passing and account for 467 of Texas' 556 yards of offense. As he routinely knifed through Trojan defenders in the second half, I began to hope that the Tennessee Titans could use their number three pick in the NFL draft to bring him to Nashville and learn Offensive Coordinator Norm Chow's system under his mentor, Steve McNair. Of course, Young has yet to declare his intentions to enter the draft and forego his senior season, but one wonders if, like Matt Leinart decided last year, he'll feel like he still has more to prove in the college game. If he does return, it would be for a run at the Heisman and back-to-back championships. If he leaves, he will have his detractors in draft pundits who look at Matt Leinart as the second coming of Joe Montana and Young as a raw and undisciplined talent with an unorthodox throwing motion. Young, the first quarterback in NCAA history to throw for 3000 yards and rush for 1000 yards in a single season, will prove them all wrong. The only question is, "When?" Out with the Old. In with the New... Baby.